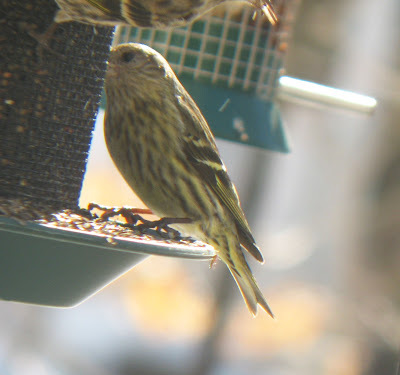 Notes about birds, birding and travel from the Pioneer Valley in Western Massachusetts. 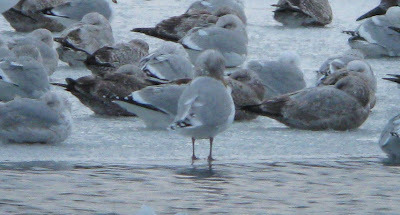 Unidentified first-cycle gull - Windsor Landfill, Hartford Co., CT - February 26th, 2009. 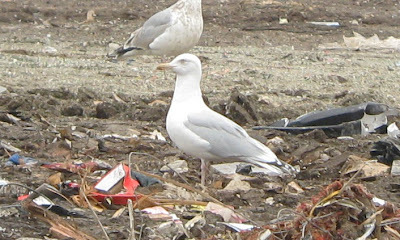 Found towards the end of another Windsor Landfill visit, this extremely bleached and faded large gull jumped out from the pack as a bird of interest. 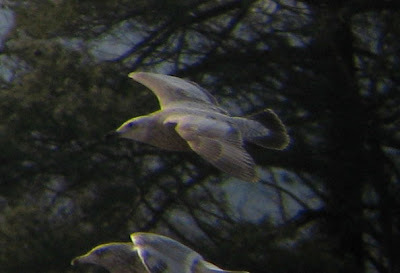 It appeared to be a first-cycle bird with an almost entirely dark bill and mid-brown primaries. 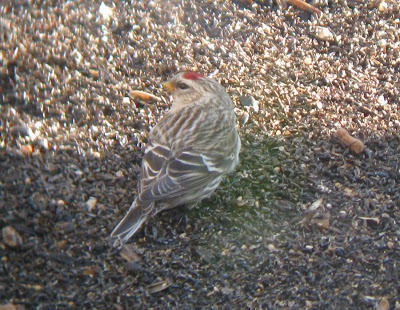 The bird was large, out-sizing most of the surrounding smithsonianus. 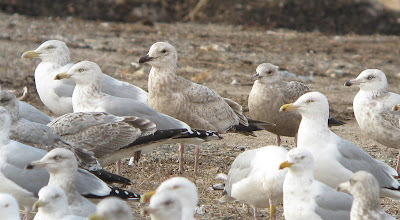 Out of interest, it's worth comparing some of this image set of first-cycle Slaty-backed Gulls from the excellent Japanese Gull site. These were also taken in late February. 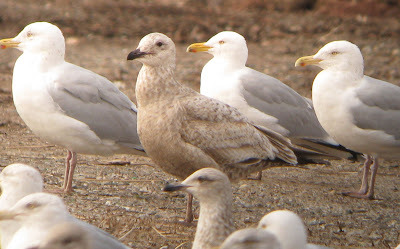 Slaty-backed Gull - 2nd/3rd cycle, Barton Cove, Gill, Franklin Co., MA. 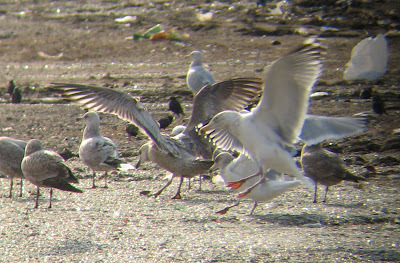 Slaty-backed (2nd/3rd cycle), Great Black-backed, American Herring and Lesser Black-backed Gulls, Barton Cove, Gill. Image taken from Gill side though here the birds are in the middle of the channel. 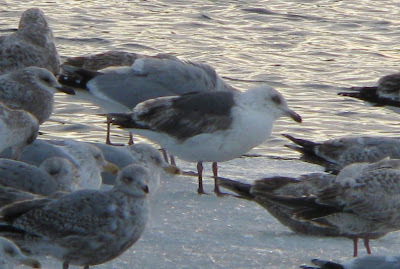 Slaty-backed Gull - 2nd/3rd cycle (center), Barton Cove, Gill, Franklin Co., MA. 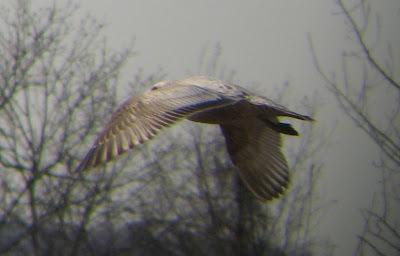 After gulling at Windsor Landfill, CT, I decided to take the long diversion home and call in at Barton Cove once again. 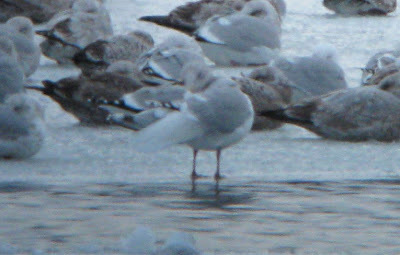 No birders were present on the Gill side of the river when I arrived, maybe not too surprising in view of the appalling light and the presence of very few large gulls. 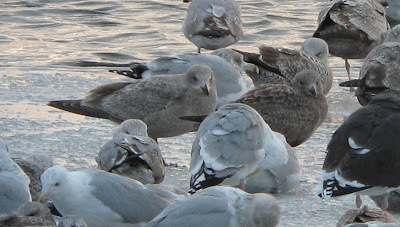 Most of the ice had gone after a mild night and day, but a pocket remained very close to the dam and held just a handful of birds. 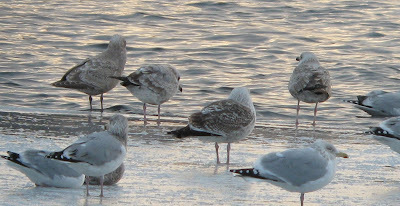 By viewing through a chain-link fence I was able to get some moderately close views of the resting gulls and decided to concentrate my effort from here. 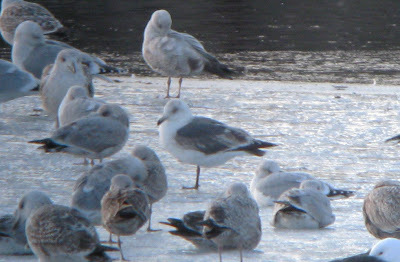 Slowly more birders arrived, as did the larger gulls and it was one of my field companions who picked out the Slaty-back very close to us on the ice just before 5pm. 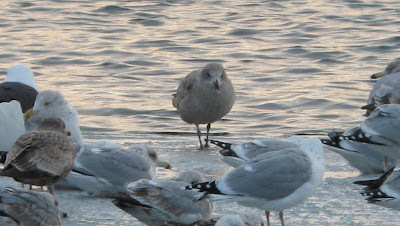 Only seconds later, the gulls suddenly spooked and the Slaty spent the remaining time out in the middle of the ice free water close to Unity Park. Ironically, the views from Unity Park on this particular evening would have been very good. 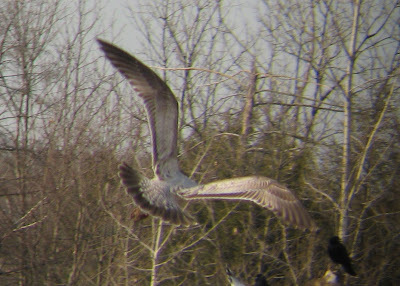 All the gulls flew up river without returning after an immature Bald Eagle passed through at around 5:20pm. Spent four hours at Windsor/Bloomfield Landfill today. As usual, an overwhelming experience with about 5,000 birds present at peak. 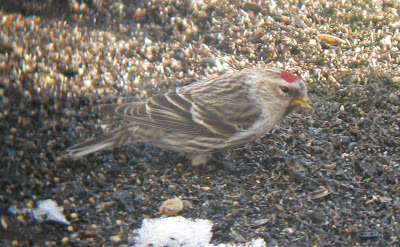 Lots to see and quite a few birds that I left unidentified! This very interesting adult was the first bird that really caught my attention being large and pale with rather reduced amounts of black in the primaries. 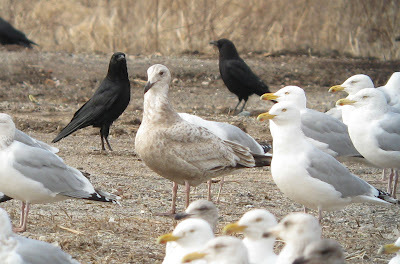 Closer inspection revealed the primary tips to be dark slaty-gray rather than jet-black, similar to some adult Kumlien's Gulls. 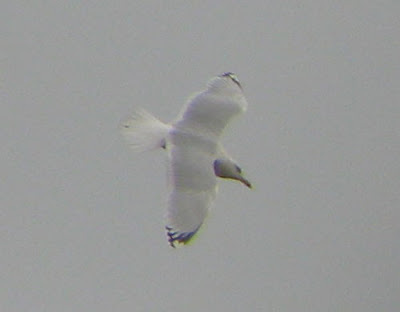 In fact, the overall appearance, especially in flight was not unlike a huge Kumlien's Gull. 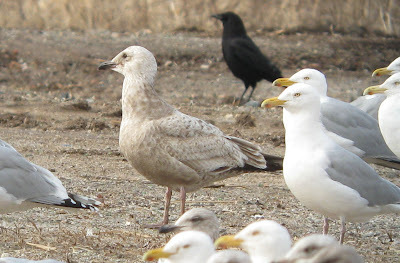 The bird was larger than most American Herring Gulls present. 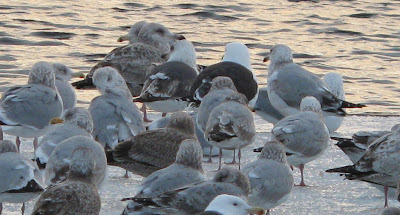 The combination of characters, including a pale lemon eye color all seem to point towards an adult Nelson's Gull (Glaucous x American Herring hybrid). Spent the whole day with Matan but still recorded some nice species, most notably this fine male Common Redpoll which visited the deck in mid-morning and mid-afternoon. 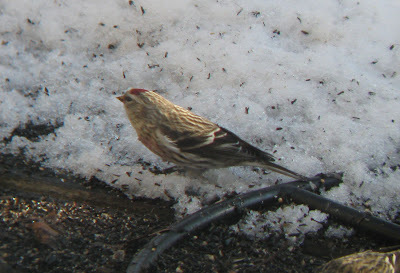 I've been hearing Common Redpolls in Amherst for about the last 10 days, so it was rather sweet to finally get one in the yard with the Pine Siskins. 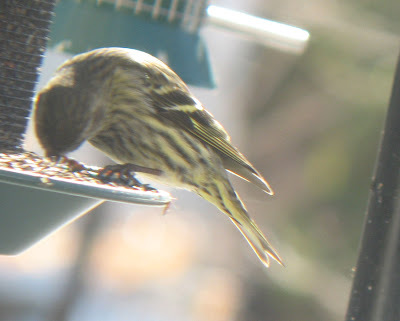 Also included here, a late post of our 4th 'green-morph' Pine Siskin of the winter on Feb 17th. 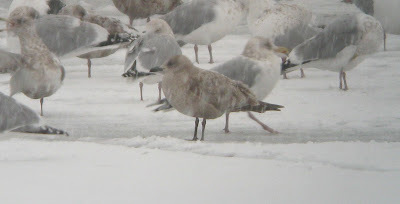 Here showing a nice yellow wash across the breast, along the flanks and the undertail coverts. 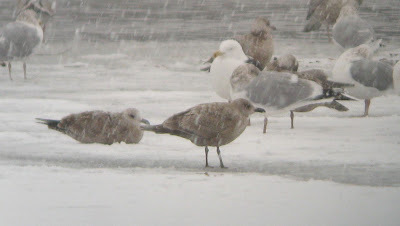 In the afternoon, a quick drive up to Turner's Falls with Matan found the Slaty-backed Gull resting distantly on the ice buried within a rather sizeable gull flock. 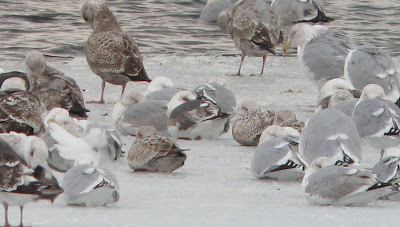 Many birders seemed to be admiring the Slaty from the Gill side of the river. 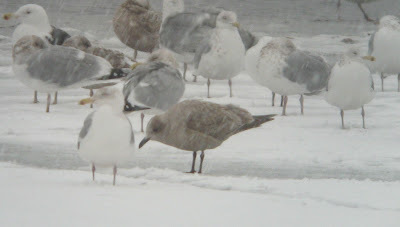 Also, present, the unidentified 'Thayer's-like' Gull and a two adult Lesser Black-backed Gulls. 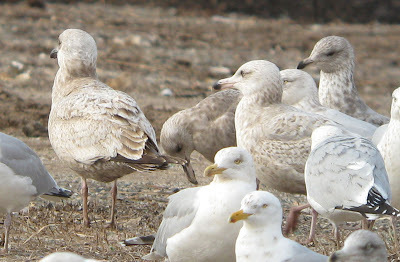 Unidentified first-cycle gull (left) with American Herring Gulls - This bird, which shares some 'Thayer's-like' characteristics, continues at Turner's Falls without any firm conclusion being drawn on the identification. 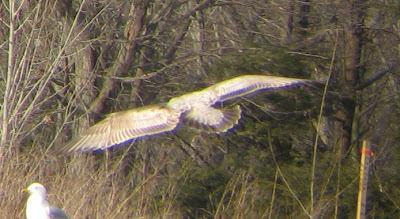 We are lacking good images of the spread wing and tail pattern though these features have been seen to show a Thayer's-type pattern in the field. 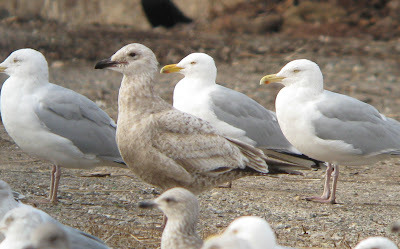 One of the biggest concerns is size as this bird often appears as large or fractionally larger than many of the American Herring Gulls present at the site, and Thayer's should average smaller and slighter. But, I'm beginning to wonder about the judgement of size in the field as the bird doesn't look absurdly large in any of the images within this selection. Also included here, several shots taken during a snowstorm on Feb 18th. 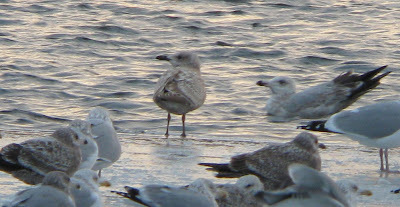 Naturally, I'd be interested in receiving any comments on this bird, especially from birders currently having regular sightings of Thayer's in thier normal winter range. 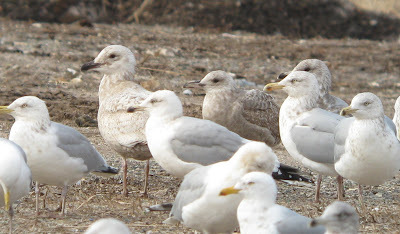 Thayer's Gull (center) - adult found late (17:35hrs), unfortunately after all the local birders had left having seen the Slaty-backed Gull. 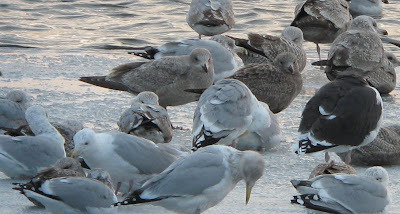 The bird was bathing when I first noticed the rather white looking underwings, otherwise I might have passed over it as an American Herring Gull. 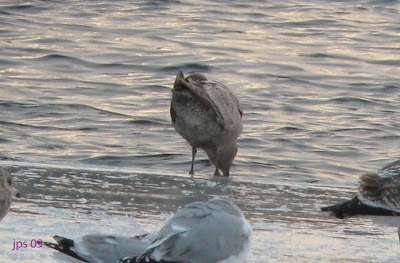 However, clearly a smaller bird with a more petite shape, shorter reddish legs and medium-dark eye. 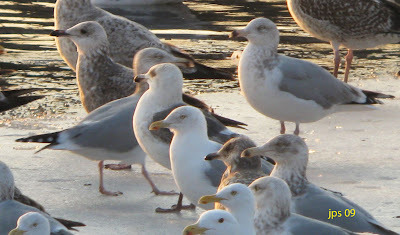 In this light, the upperpart tone was virtually identical to American Herring Gull. NB. More notes to be added to these shots soon. 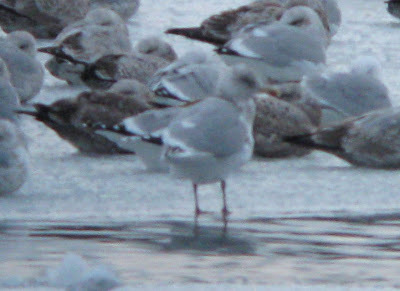 Another brutally cold evening at Barton Cove, Turner's Falls, but some really excellent gulling with seven species present. 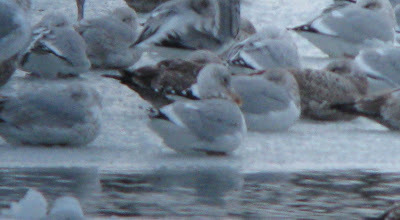 The Slaty-backed put on a fine show and was already present on the water at Barton Cove when I arrived at 4:10 pm. 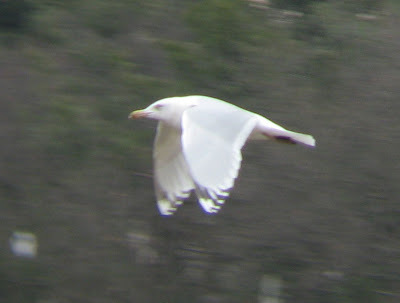 It then showed to a host of admirers until dusk, viewed mostly from Riverview Drive in Gill. 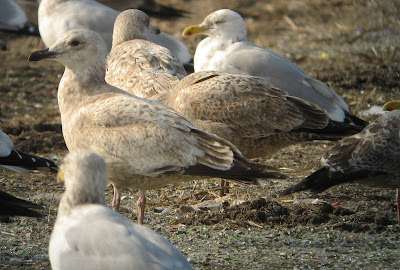 Slaty-backed Gull - 2nd/3rd cycle (center). The first distant views from the boat launch off Unity Park, Turner's Falls, Franklin Co., MA. Feb 20th, 2009. 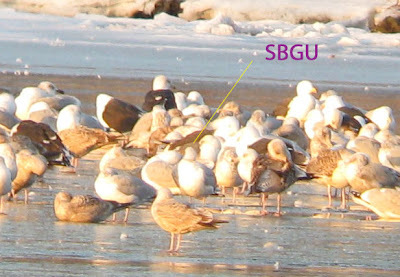 This 2nd/3rd cycle Slaty-backed Gull was discovered in the smallish gull roost at Barton Cove on the evening of February 20th with about 500 other large gulls present. Initially, I picked it up at distance resting on the ice near the dam viewing from the Turner's Falls side of the river . I drove around to Gill hoping for better views only to find the bird roosting until all the gulls were flushed by a Bald Eagle. 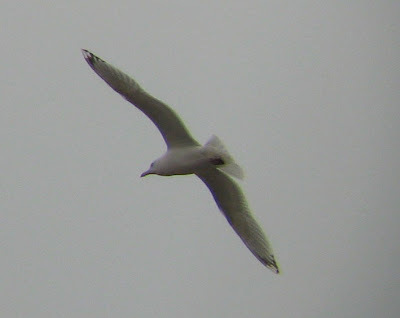 The gulls then spent the next 30 minutes in the air and I didn't see the Slaty-backed again. I decided to hold back from making a full alert primarily because I hadn't seen all the critical features well enough to be certain of the identification. On Feb 21st, I returned to the site along with Susannah Lerman, Nick Bonomo, Brian Kane and Scott Surner. It was actually Nick who spotted the bird first, just after a late arriving flock of gulls came in from the North shortly before 5pm. From that moment we had the bird in view and watched it from both sides of the river until we left at around 5:45pm. 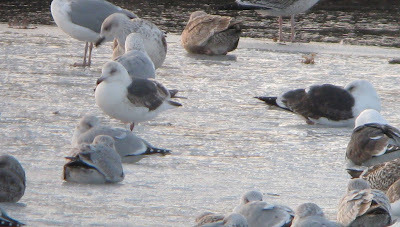 Amazingly, this is the same individual Slaty-backed Gull that spent a week at the Windsor/Bloomfield Landfill during February 9th - 13th, which can be identified by comparing the plumage and bare part features here. If accepted, I believe this will be the first record for Interior Massachusetts. 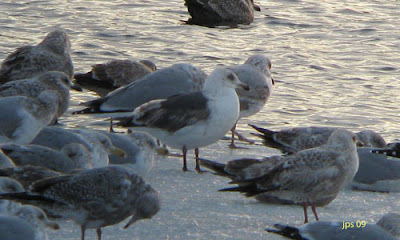 Slaty-backed Gull - 2nd/3rd cycle (center). Crop from the above shot off Unity Park, Turner's Falls, Franklin Co., MA. Feb 20th, 2009. 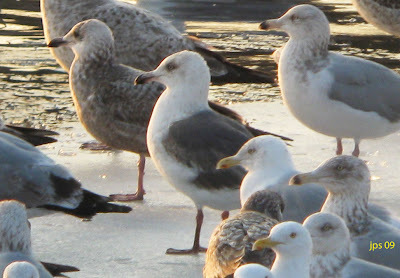 Slaty-backed Gull - 2nd/3rd cycle (center). Closer views from Riverview Drive in Gill, Franklin Co., MA. Feb 20th, 2009. The bird frustratingly roosted here until all the gulls got flushed by a Bald Eagle. 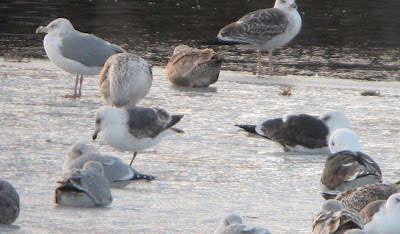 Slaty-backed Gull - 2nd/3rd cycle (center). Reasonable views at dusk from Riverview Drive in Gill, Franklin Co., MA. Feb 21st, 2009. Having seen the bird well in strong sunlight from the Turner's Falls side of the river we drove around to Gill around sunset and decent looks there. Glare can seriously hamper the viewing from Riverview Drive on a cloudless day as it was on the 21st. 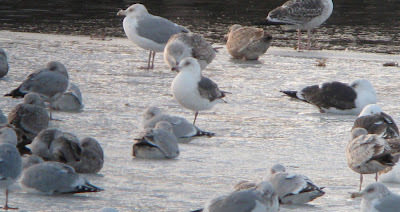 MA - Laughing Gull in Gill! 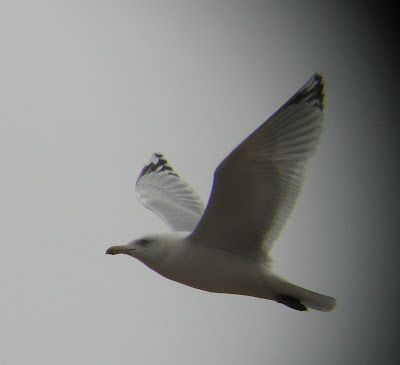 Trinidad - Audouin's Gull, new to South America!